If you own a ’67 Beetle, sooner or later you’re going to have to experience the intimate task of replacing the muffler. It can be a dirty job. Not to worry; 1967beetle.com is here to make sure you get the job done right. Let’s discuss the task. With the engine cooled down, elevate your car with a floor jack at a comfortable working height. To allow for easy access to the muffler’s mounting location, support vehicle with jack stands (this also spares your knees from abuse). Remove the rear engine tin (breast plate) and proceed to remove the old muffler. Due to the extreme changes in temperature, the securing hardware often becomes seized, making them difficult to remove. If excessive force is exerted, you risk shearing the studs from the cylinder head. Re-placing broken cylinder head studs is a tech tip in itself, BE CAREFUL. Do not hesitate to useheat on the nut, or invest in a nut cracker to break the nut(s) free. With the removal of the old muffler finished, I like to clean-up the heater box tube with a pair of channel locks. Adjust the channel locks to the proper size and lightly grip onto the tube and slide back and forth while rotating the channel locks. This strips the layers of rust and makes the installation of the sealing rings much easier. One more detail, as long as you have the rear engine tin out, inspect the engine to body seal and replace this if necessary. This keeps heat from the muffler from rising into the engine compartment. As we all know, heat deflection is an element which needs to be avoided, especially with air-cooled motors. Now we’re ready to install the new muffler. Always compare your new muffler to the old muffler, thus insuring that the replacement is correct for the car. If the motor is a 40 h.p., make sure that you have the correct version to match the heating system (stale or fresh-air). Are the lower heater box to muffler connections the same length and distance apart? A quick measurement here avoids hours of frustration later. After confirming that the muffler is correct, install the exhaust tips. Not only is it easier to install these while the muffler is outside of the car, they make great handles for maneuvering the replacement muffler into place. 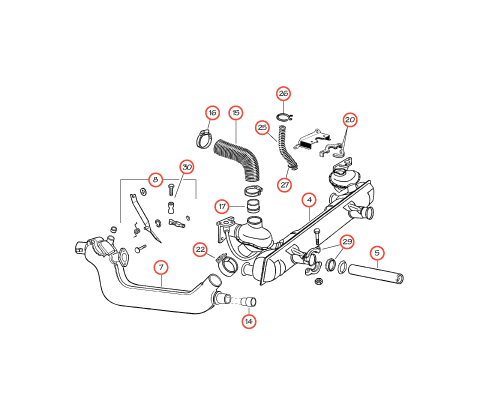 Run a tap through the preheat pipe flanges (the pipe that is connected to the intake manifold and flanges into the muffler). The flanges are often caked with primer, making the thread channels obstructed. Fitting the flanges is often the most difficult task in muffler replacement and clean threads sure come in handy (as you will find out later!). A V.W. Master Mechanic showed me this trick. On all of the fresh-air replacement mufflers available on the market today (yep, even the German units), you will find a baffle located directly inside the inlet tube (the part of the muffler that connects to the heater box). This baffle consists of a number of holes that for some strange reason, are a great deal smaller than the factory installed mufflers. If left alone, your engine will run hotter, and could prematurely end your engine’s life. Open the baffling with the use of a punch or screwdriver. Simply insert the punch or driver into the inlet tube, and strike with a hammer. As we mentioned earlier, the hardest part of the fitting process involves the preheat pipe flanges. Because of this I always inspect/install these first before starting any other nuts. I use a combination of tools to twist the flanges into alignment. Channel locks, large vise grips and a pry bar to mention a few. Be patient in threading the bolts into the flanges as cross threading can easily occur. To aid in the installation process, use a rubber mallet to help the muffler find its home. A rubber mallet gives the extra needed force for fitting the muffler, without bruising the surface. Always leave the lower heater box to muffler clamps the last step in the installation process. This will insure that this connection is fully seated. Now, lets look at video on how to do the job. It’s on a ’72 Beetle, but the general process is about the same. I hope this information helps. Doing the work yourself on these old cars is really simple and will make you feel good, knowing you don’t need to rely on anyone but your own two hands. Very helpful article. In case people have not heard, German mufflers for old VWs are no longer being made. HEY JUST WANTED TO GIVE YOU AN UPDATE ON THAT. I JUST BOUGHT A GEMAN MADE MUFFLER FOR MY 74 SUPER. I GOT IT FROM JBUGS. One thing which I would note regarding the tail pipes (tweeters/P-tubes) for 1967 Beetles: for the ’67 Beetle, the tail pipe length (the part sticking out of the muffler) is measured not by sticking the pipe into the muffler and marking it. First…it is necessary to purchase the correct length of tail pipes. This can be difficult to do, and expensive, unfortunately. The correct length should be about 27.5 centimeters (approx. 275mm). Wolfsburgwest offers the correct length of pipes (they call them “exhaust tips”) 1955-1967, for $10.50 each, plus shipping. Given that one has found the correct pipes–insert the pipe. Measure from the outside edge of the clamp (away from the car) to the tip of the tail pipe. The correct length should be 21 centimeters (or 210mm). This gives the proper “draw” (just like a chimney) and clears the bumper, as well. And…gives that wonderful whistling sound which ’67 VW owners love to hear! Great info! I like the stainless tailpipes that Wolfsburg offers. No rust! Then the near exhaust manifolds go right into the silencer with holes down its length used to diffuse. This is how aftermarket ones did it with diffuser screens as seen inside this diagram I did. all welded up, this was tack welded in situe on the engine, later I made a jig for cutting the holes in the main tube. The later exhausts I made used the plugged ends here, these were good as you tapped them in and then tig welded the lips together, neat seam. I made a few to sell but alas i’m no salesman so only ended up selling two. tools , ends curved over with a die made on a lathe and then a big hammer.